The Tamil term ‘Aadi Velli’ denotes the Fridays that fall during the Tamil month of Aadi (July-August), which glorifies Goddess Shakti - the divine feminine power. Aadi Friday celebration also heralds the onset of the monsoons and signifies the power of the water Goddesses. According to Vedic astrology, the month of Aadi is marked by the transit of Sun into the sign Cancer , ruled by the Moon. Astronomically, this transit of Sun marks its journey towards South known as Dakshinayanam. This Tamil month Aadi is auspicious to worship Goddess, the ruler of Moon, for spiritual progress. Hence, weddings and household functions are not conducted during this month. Also, with the beginning of this month, the heat of the sun reduces, and monsoon commences. It is during this time that the rainfall peaks on the west coast, and the rivers of Tamil Nadu that were shrunken during summer, get replenished, often to near-full levels. Usually, the Tamil months are named based on the Nakshatra (star) that prevails during the full Moon day or Pournami. In Chithirai month, the full Moon day happens during Chithirai Nakshatra, in Vaikasi month during Vishakha Nakshatra, similarly, in Aadi, the full Moon day happens during Ashada Nakshatra, and thus, this month got the name Aash Aadi (in the north) / Aadi (in the south). According to mythology, during the month of Aadi, Goddess Shakti manifested as Pachai Amman to establish peace and harmony in the world. 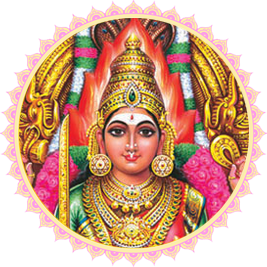 Pachai Amman or Kanni Amman, by her inherent energy, appeared in many holy centers, and her presence enhanced the divine powers of these localities. In her manifestation at Thirumullaivaayal, she established peace and prosperity in the world. Also called the Goddess of marriage and fertility, she showers her blessings on young maidens aspiring for a suitable groom. All the Fridays of Aadi month are considered very auspicious to propitiate the divine mother when people perform special Poojas at Goddess temples and homes. Offering your sincere prayers to Shakti on Aadi Fridays can promote positivity and overall success in life. This Fire Lab is targeted to help with dating/marital related issues. Invoke Goddess Durga, who has the power to bless you to overcome marital and relationship issues. The Prathyangira Devi Homa (Fire Lab) is performed to lift the shroud of negativity bogging you down and envelop you with a shield of positivity.